Expanded polystyrene (EPS) and eXtruded polystyrene (XPS) are both closed cell foams and similar in appearance but the main ingredient, manufacturing process, and resulting emissions and material properties are very different. The Functional Unit is 1 m² [10.764 ft²] of rigid cellular polystyrene (RCPS) insulation board with a thickness providing an average thermal resistance of RSI = 1 m²·K/W [R-Value of 5.678 hr·ft²·°F/BTU] and with a building service life of 60 years. Both EPS and XPS are closed cell polystyrene and hydrophobic with a low equilibrium moisture content meaning they do not readily absorb moisture from the atmosphere or surroundings. We all know XPS for its use in commercial buildings supplied by large corporations in mostly pink, blue, and green boards. And many of us remember XPS for its use in fast-food packaging with extremely ozone-layer depleting CFC Gases before the worldwide ban starting in the 1990s. Since then many insulation materials including Polyisocyanurate and XPS use HCFC Gases which the whole world also agreed to ban due to high GWP. The HCFC Gases escape from XPS at a slow rate. In contrast, EPS uses pentanes as the blowing agent which get replaced by air, mostly during manufacture and completely a number of weeks or months later depending on product thickness. Aged EPS is about 98% air with no off-gasing and has always been free of CFC, HCFC, HFC and formaldehyde. The HCFCs in XPS and polyiso have lower thermal conductivity than air, allowing claims of higher R-Values per inch thickness than EPS. However, that's only because the applicable laboratory tests are very short-term at 180 days or using estimates of ageing to 5 years. After 10-15 years the reality is very different for the remainder of a building's long life-cyle: as the Gases escape from XPS, it should approach the R-Values per inch thickness of EPS. The warranties of XPS-manufacturers confirm this by only covering 80-90% of the advertised R-Values. The estimated 5-year values are also often labeled "Long-Term Thermal Resistance (LTTR)" as an approximation of the time-weighted average performance over the first 15 years, which isn't "long-term" for buildings. In reality the R-Value of XPS in year 15 is already well below the 5-year "LTTR" and it keeps decreasing from there. In contrast, dry EPS does not loose R-Value over time which is why the National Institute of Standards & Technology (NIST) chose it as the Standard Reference Material for Thermal Conductivity (SRM 1453). XPS R-value loss reached more than 80% in some cases, which means a 2" thick XPS board advertised as R-10 would actually perform at less than R-2! 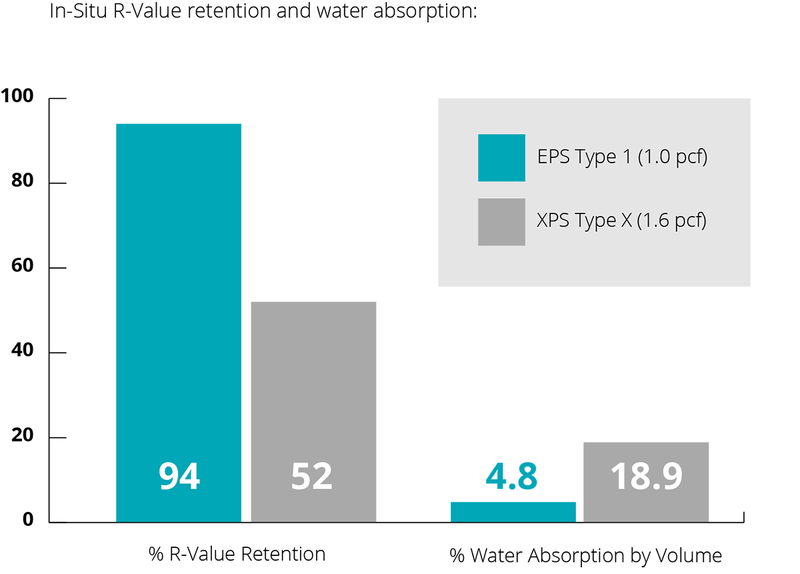 EPS R-Value loss was only about 6% in a 2008 test of side-by-side, below grade application following a continuous 15-year installation period due to limited EPS water absorption. So a 2½" thick EPS board with an original insulation value of R-10 would still perform better than R-9. 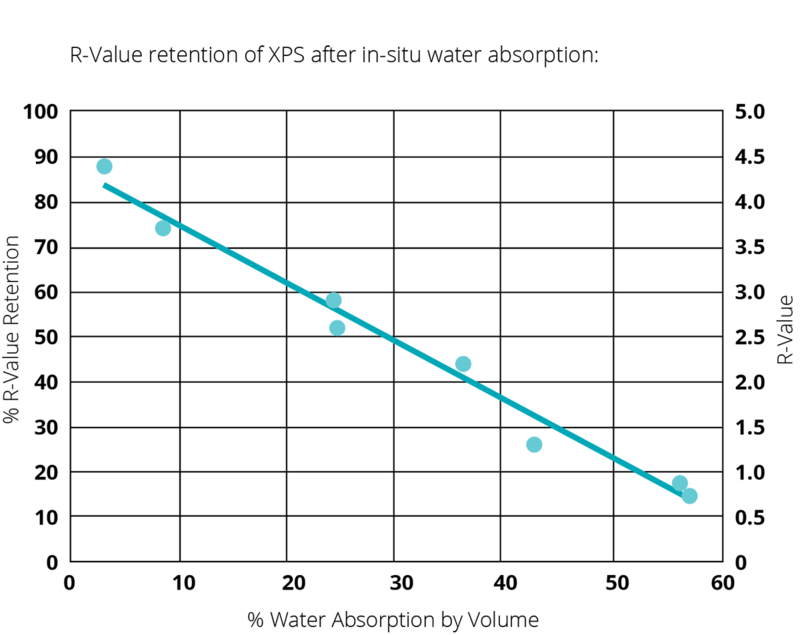 This difference is due to XPS' Gases and higher encapsulation of cells which the XPS industry touts as being superior because it slows down the exchange of water, vapour, and gases - but only for short-term effects. Over the long lives of actual buildings XPS admittedly emits HCFC Gases getting them replaced with whatever is around it - air, if your installation remained sufficiently water- and condensation-proof but in some installations with water! Below-grade and roof insulation seem most susceptible where repeated and/or sustained presence of water or condensation are more likely. In addition the material differences cause low drying capacity of XPS compared to the significant drying potential of EPS as reported in another Technical Bulletin about tests per ASTM C1512 - Standard Test Method for Characterizing the Effect of Exposure to Environmental Cycling on Thermal Performance of Insulation Products. 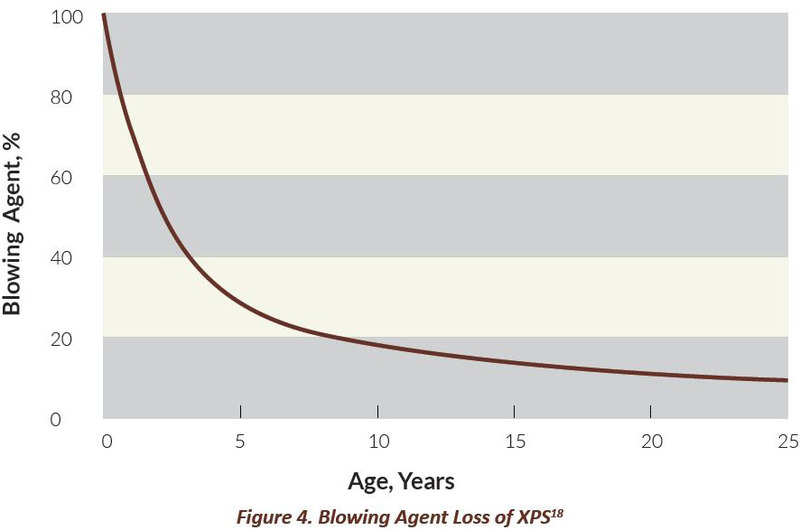 Combining the factors in real-life conditions can result in water-logged, useless XPS leaving building operators at higher risk to pay for wasted energy and possibly large sums for remediation because XPS won't dry out as easily. High 50-year Thermal Resistance and the ability to dry insulation that was exposed to water are in the owner's best interest and building designers should advise & specify accordingly. In response to the EPS Industry Alliance technical bulletins that report on tests conducted per industry consensus standards (ASTM) by independent testing laboratories, and also corroborated by third-party research by the Oak Ridge National Laboratory, one XPS-manufacturer promptly developed a tagline and website with content heavily relying on unrecognized, made-up tests such as digging a hole in the ground to bury samples for three weeks. And of course they keep repeating the short-term laboratory tests that don't necessarily address real-life conditions over the entire building life. For actual 50-100+ year building considerations XPS and polyiso with HCFC gases overstate R-Values and they are heavy polluters while EPS realizes the GWP reductions of insulation with much lower environmental impacts and stable insulation values over time. EPS also offers the highest insulation value per dollar spent!